Listening, and learning, and looking with care. With fingers skillful to make and repair. Shining with love for everyone. Ship’s Light Candle Room (Create a beeswax lantern while listening to delightful music in an enchanting space.) Located in the 2/3rd grade classroom. 5 tickets. Mermaid’s Cove – Children will crawl through an enchanting cave to reach the Mermaid’s grotto, where they will receive a handmade gift. Located in the Seahorse classroom. 4 tickets. Meet the Mermaid – Meet a real live mermaid and tell her your holiday wish! Magical Puppet Story -The Fisherman and the Quiltmaker – A captivating tale, enjoyable for all ages – located in our kindergarten. $5 per family. Adding to the wonder of the experience, don’t forget the magical Mangrove Mother Faerie as she roams among the children to offer treasures in exchange for a ticket. Delicious Organic Non-GMO Faire Food + Live music too! A variety of selections – including gluten free and vegan options. Gather around the fire for some delicious hand toasted Norwegian Fire bread. We will have several raffle baskets as well with items perfect for gift giving! Thank you so much to all who are volunteering their time tomorrow. We have a few spots left for ticket takers throughout the event if you have some time to spare, as well as helping with the breakdown. We also gratefully accept sponsorships! We would love to have 100% participation please let us know how you can help make this THE family of event of the season for SRQ! Dance. Play. Explore. We are so excited to introduce a new program for all ages. Creative dance classes develop musicality, coordination, and spatial awareness in a nurturing environment as each child is encouraged to express his or her individuality through movement. Wendy Johnson, who received her ballet training in New York City at the Joffrey School of ballet and the David Howard School of ballet. She has been teaching creative movement and ballet technique to children for over twenty years first in Santa Monica, California and later for School of Richmond Ballet as well as locally in Sarasota and she is passionate about bringing a love of dance to students of all ages. She homeschooled her own children using the Waldorf curriculum through high school age, and is well-versed in creating developmentally appropriate childhood learning experiences from toddlers to teens. Classes run in 4 week sessions and are offered Wednesdays 9:30-10:15 for Early Childhood age students, and Tuesdays 2:45-3:15 for Grades age students. Each 4 week session is $65. Our lantern walk will be held on Friday, Nov 18th at 5:30 pm, on Siesta Key Main Beach. Forest Kindergarten Program Begins November 29th! In line with our vision of a deeper connection to nature for our students, we are so excited to offer a Forest Kindergarten program to Early Childhood age children! Using an innovative curriculum, the children will experience the wonder of nature immersion our Grades students have enjoyed for several years. In this program, they will be able to explore Mother Nature in a developmentally appropriate way, with their teachers as loving guides. Plant investigation, outside projects, and wildlife watching are a few of the activities that will be a part of this new creative endeavor. Cognitive – creativity, problem-solving, focus and self-discipline. Social – cooperation, flexibility, and self-awareness. Emotional – stress reduction, reduced aggression and increased happiness. Please spread the word about this new Early Childhood option! Our Early Childhood teachers will be on hand tomorrow at the Faire to answer any questions you may have. Need more time to get it all done? Your child can enjoy delightful seasonal stories, games, activities and crafts for gift giving with a mix of outdoor and indoor play in a nurturing environment over the break! Please call 941.927.3711 to register. The Seahorse Pre-Kindergarten is having a great time.We have been having class outside many days a week since your children and,really everybody, is enjoying the beautiful fall weather. We have been carving pumpkins into Jack o’ lanterns, singing Halloween songs and rhymes and watched our beloved Halloween puppet play about the “naughty hobgoblin” who plays tricks on everyone. We are now slowly moving into Thanksgiving time and have a circle with “Little eagle feather” and started to sing a native american song accompanied by drum. Our garden is growing slowly and beautifully, thanks to all the little hands, that help tending to the plants every day. We hope you are all enjoying the beautiful Fall weather as much as we do and see you all at the Mermaid Faire. The kindergarten has spent a lovely time outside as the weather has been cooler. We have roasted apples in the fire pit and planted beans in pots around the teepee. A big thanks to Erin Cunningham, Yolanda Benoit and crew for cleaning up the play garden. It looked wonderful! Thank you also for the purple zinnias that we planted in the new garden beds. Some of our other activities have been a puppet play called “Winifred Witch and the Golden Cat”. We also did leaf rubbings, and wax dipping with leaves. We used our fall cookie cutters to make special bread for snack and celebrated Zoe’s 5th birthday. Zoe’s Mom Agnes came in and read to the children one of Zoe’s favorite books. The children really enjoyed this. Ms. Jessica also came with the 1st grade to sing happy Birthday to Zoe in French. More recently, the kindergarteners have been busy carving pumpkins outside with the Seahorse children. We really enjoyed the funny faces that were carved in the pumpkin and look forward to eating the pumpkin seeds that will be roasted over the fire. We heard the story of “Pumpkin Crow” from the Tiptoes books – about a crow who gets his head stuck in a pumpkin and can’t get it out. We planted the rest of the purple zinnias, chocolate mint, and lemon balm herbs. The pea plants are growing very big and they almost reach the teepee wire. Charlie’s 6th birthday came and we had a wonderful celebration. We got to see pictures of Charlie when he was little and hear about his life. We can’t forget about the Hobgoblin puppet play that Ms. Laura, Ms. Birte and Ms. Renee did for the Nursery, Kindergarten and 1st grade. On Halloween we had a story called “Owl and Witches”. After Halloween we started a new circle about Little Eagle Feather and his quest for fire to save his village. Many more projects and fun are yet to come and we look forward to them all. A few new changes have been welcomed by the first graders. The weather has been glorious in the mornings, so before we start our morning verses and main lessons we have been joining the kindergarten and nursery children out in the play garden. Last week while outside the children collaborated together and created a faire. They worked together and raked up a big pile of pine needles and jumped into the big pile. It was like a Florida version of jumping into a big pile of fall leaves. They also made hay rides at this faire. Cooperation, collaboration and communication at it’s finest. We have been playing new games. It’s fantastic because they don’t realize that they are actually learning. The games are a phonemic awareness and pre-literacy. Children who are aware of phonemes move easily and productively into inventive spelling and reading. Our favorite one right now is listening to sequences of sounds. This game helps to develop the memory and attention abilities for thinking about sequences of sounds and the language for discussing them. I have fun trying to come up with new sounds and they giggle at the new sounds and experience sounds in a new way. We continue to make our first knitting project. I, too have been learning how to knit right beside them and I am really enjoying it! We have many more exciting times ahead of us. 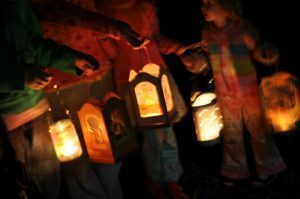 With flute playing and lantern making on the horizon, we joyfully go about our days while painting, singing and creating lifetime memories. In the 2nd 3rd grade class, we have been continuing our work with the multiplication table and we are now up to the 5’s. Ms. Stephanie has been taking a few students to the Wednesday Market at Phillippi Park with shopping lists and money to practice their math skills too. Song has come to our classroom! We have been learning a few songs in preparation for our winter assembly and the children are enjoying singing very much. We are continuing to learn how to spell new words from the stories that we are reading with a little check in weekly to see how we’re doing. We are making lanterns in preparation for the lantern walk, with many weeks of painting and oiling. As we have since the beginning of the school year, we continue to learn about how golden manners help us all feel comfortable and appreciated. The children are looking forward to the much anticipated Mermaid Faire and all the special memories that come along with it. Time flies when we’re having fun – it is hard to believe we are nearly mid-way through November! Over the past few weeks, the children have been fully engrossed in the world of numbers. This block began with a thorough review of everything they have learned so far, making this an excellent time to be a new student, as they get a chance to do all sorts of dynamic math exercises they may not have been exposed to previously. Ten and eleven-year-olds, developmentally, are very much in a threshold space, taking a long look back on their childhood, as well as looking forward to adolescence and beyond, so math review, then moving forward in complexity is an excellent exercise for them on a soul level. Vertical operations, math puzzles, and fractions are a few of the elements we have built upon so far. In addition, as previously mentioned, Grades 1-4 are for planting seeds, and grades 5-8 are for weeding and harvesting, so this is an important year to solidify all math operations and procedures as they move forward and take a huge cognitive leap in sixth grade. And again, the hope is to cultivate a feeling of capability in math, so we do a lot of hands on exercises, games, and activities so the children are enjoying themselves, even if math isn’t their favorite subject. We have had fun using math to figure out all kinds of things that interest us from day to day- sea turtle eggs, road trip miles, votes in elections, and more. We have been busy in other ways as well! This month the class also enjoyed a camping trip to experience the truly magnificent springs we studied in our Local Geography Block. They delighted in swimming right above where the spring was coming up from the aquifer, taking a kayaking trip, telling stories around the fire in the evening, and building forts in the jungle beside our campsite. Lifelong memories were made, for certain. Local animals, and their conservation has come more into our consciousness, deepening our connection to the area, as we began a study of the common sea turtles that share our gulf and beaches. Long Boat Turtle Watch came by to give us some hands on experience with our new knowledge – the children learned how to identify, label and excavate a sea turtle nest. They also learned some first hand stories about local sea turtles, how each one of them can help to save them, and why it is so important to do so. We also began a “Circus Science” block, courtesy of the Circus Arts Conservatory. This is another way of linking to our past, as the circus played a significant part in Sarasota’s more modern history. Using math, science, engineering, art and team problem-solving the students will produce a contraption-based circus performance over the next six weeks. They are really enjoying this experimentation, and it has been a wonderfully motivating way for them to collaborate together. The culmination of the unit will be attending the performance of an arena sized Circus Machine at the Sailor Circus. Thank you to the Circus Arts Conservatory! Their dramatic presentation of The Sign of the Beaver is nearly ready, and they would like to present this to you in the beginning of December. I will touch in with you regarding performance times. They continue to enjoy Handwork, Woodworking, Eurythmy, French, Form Drawing, Spanish, Violin, and their Forest days. They also planted their medicinal plant seedlings, and have been rotating through yoga, partner yoga, and fitness drills. This past week they also contributed to the map portion of the Mermaid Faire program. Looking ahead, the students will be creating an issue of the Mangrove Messenger, completing acts of service out in the community, and sculpting with a new medium – wool! Always fun, always an adventure with these children! Saltmeadow is very happy to be sponsoring a new Navigators Scouts chapter (#142). We believe that the Navigators philosophy is a good fit for Saltmeadow: inclusive, co-ed, and secular. We’ve begun to earn our paddle sports badges with a kayaking expedition from Philippi Park. For more information about Navigators USA: www.navigatorsusa.org. We have also been very busy putting together an intriguing activity for the Mermaid Faire. For those who love a good sleuthing, stop by “Poseidon’s Quest” tomorrow!